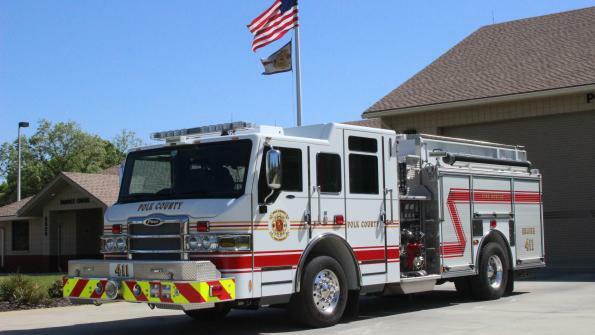 The Polk County Fire Rescue department in Polk County, Fla., has placed an order for 10 fire apparatus with Pierce Manufacturing, an Oshkosh Corp. company. The Polk County Fire Rescue department (PCFR) in Polk County, Fla., has placed an order for 10 fire apparatus with Appleton, Wis.-based Pierce Manufacturing, an Oshkosh Corp. company. The purchase includes five pumpers, a 100-foot Pierce Aerial Platform, and a heavy-duty rescue/hazmat vehicle, all built on the Pierce Velocity chassis. Three tandem rear axle tanker/pumper vehicles are also part of the order. “We purchased our first Pierce Velocity engine in 2010, and our personnel are very impressed with its dependability and overall build quality — so when the time came to order new vehicles, we concluded that it was the right decision to continue with Pierce,” said Fire Chief David Cash of Polk County Fire Rescue. “These new Pierce vehicles will reduce a significant amount of our ongoing maintenance costs, while providing state-of-the-art technology to help our firefighters save lives and protect property.” The PCFR department became a Pierce customer just over two years ago. The PCFR pumpers and aerial platform feature an optional forward roof cab design, which enhances interior space for the crew and provides good visibility. The PCFR department’s pumpers are designed to function as paramedic engines, and will be assigned to the busiest of its 45 stations. Each vehicle features seating for six firefighters and a forward facing EMS cabinet inside the cab. The pumpers also feature a 450-horsepower DD13 engine, Pierce Command Zone electronics and a 1,250-gpm single-stage pump. The Pierce Velocity Aerial Platform features TAK-4 independent front suspension, a 500- horsepower DD13 engine, a 19-inch front bumper extension, a 300-gallon water tank and a 2,000-gpm single stage pump. The vehicle boasts Pierce Command Zone electronics and it has blue LED lighting along all three sections of the aerial. The three Pierce tanker/pumper vehicles, built on Freightliner chassis, each feature a DD13 engine, a 2,500-gallon water tank, seating for three firefighters, and a 1,000-gpm PTO-driven pump. “The larger Pierce tankers will enable our department to replace 18 smaller and aging tankers that have ongoing maintenance issues,” added Chief Cash. The Pierce Velocity non-walk-in, heavy-duty rescue features a three-door cab with raised roof, seating for four firefighters, and a 21.5-foot body with roof hatches and recessed walkways. The vehicle offers a range of rescue equipment exterior compartments with adjustable shelves, slide-out toolboards and trays. PCFR is a division of the Polk County Board of County Commissioners. PCFR provides fire, emergency medical, and emergency management services to residents in a 2,000-square-mile area, and mutual aid to surrounding counties. PCFR has more than 600 full-time employees based at 45 stations, and runs more than 80,000 calls each year.